We love pancakes in any shape and size. And it is one of the easiest way to serve vegetables to your family – either mixed straight into the batter or as a filling. These Tuscan kale crêpes, a.k.a. dragon slayer pancakes, are delicious with a savoury cashew cream, but you could also serve them with grated (preferably unpasteurised) cheddar cheese or goat milk feta. And I usually reserve some of the batter to make a few plain ones to have with honey and lemon as a special Pancake Day dessert. Steam (or briefly blanch) the kale until wilted, then refresh under ice cold running water. Put all the ingredients in a blender and blend until well mixed. Set aside for at least 1 hour. To make the crêpes, heat a little ghee or coconut oil in crêpe pan until hot, but not smoking. Pour a ladleful of the batter into the pan, turning it while you pour to ensure you cover the base. As soon as the edges have browned (after a few minutes), carefully slide a spatula under the crêpe and flip it over for another couple of minutes. Repeat until all the batter has been used up. Rinse the soaked cashews thoroughly, then place in a blender with just under half a cup of water (about 100ml), salt, nutritional yeast, lemon juice and cayenne, and blend until creamy. If you don’t have access to a high speed blender, the resultant cream will have a coarser texture. 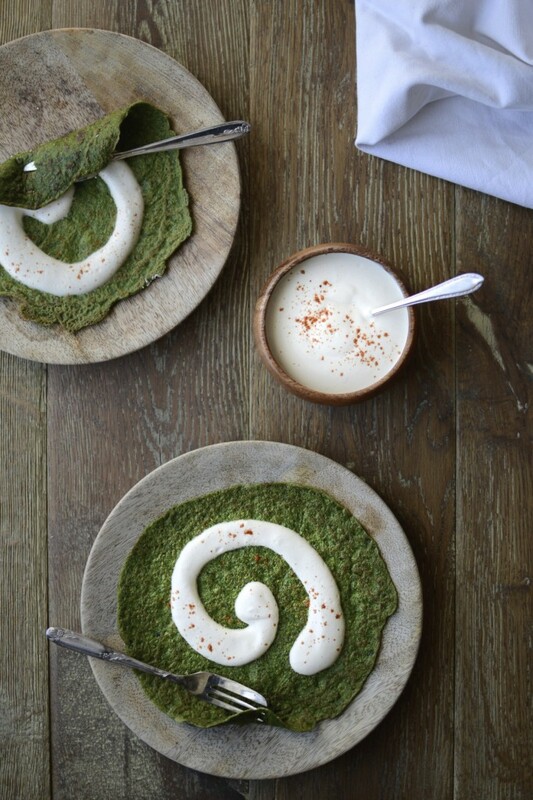 Adjust seasoning and spoon onto a green crêpe before rolling up.